Weighty Matters: Guest Post: Can Anyone Help This School-Food Frustrated Alberta Mother? Guest Post: Can Anyone Help This School-Food Frustrated Alberta Mother? Clearing out my email inbox, I came across a letter that I'd forgotten about. One that I had asked and kindly received permission to anonymously post. Am guessing this mother's story is far from unique and am hoping that there are folks out there who may be able to offer some possible solutions. I am writing to you from Alberta. My two healthy and active (after school) children attend a local pre k to grade 9 public school which they love. They do have two main complaints though (1) Mom doesn't buy them hot lunch from the school's once a week hot lunch program and (2) Gym class is often missed and the teachers don't send them outside because its too cold. Complaint #1 is easy for me to explain: It's all unhealthy junk food. This program is run by volunteers; moms who have kids in the school. I have been one of those volunteers from time to time but this year I have chosen not to. Last year while volunteering at Hot Lunch hand out I asked a few of the moms why we don't offer up healthy options. The response was defensive and much eye rolling was witnessed. The hot lunch options truly sadden me. I simply cannot hand out Arby's, McDonalds, greasy pizza, donuts, etc.... to our growing youth. I also don't buy the food from the hot lunch for my children just to 'include' them with the rest of the masses. Yes, they do complain about that and especially my oldest child. My youngest is somewhat more resilient to the peer pressures. 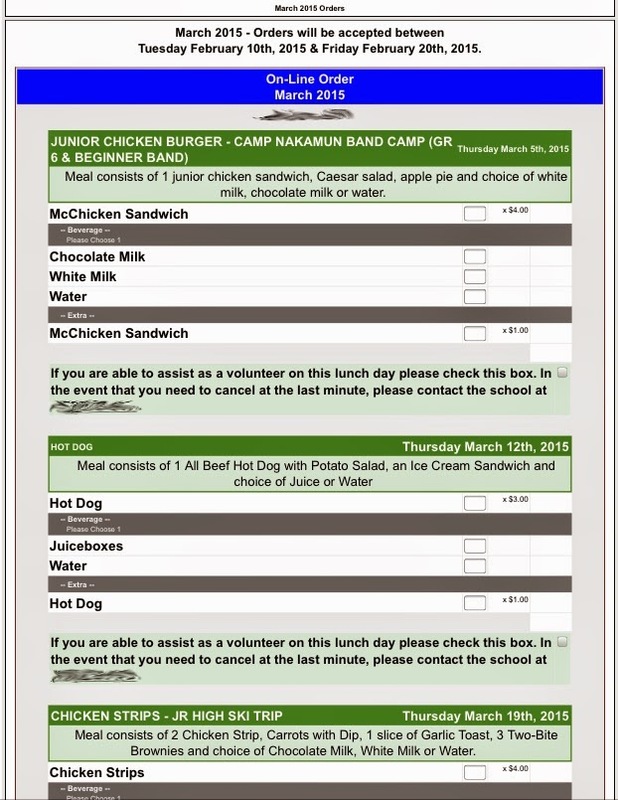 I reviewed March Hot Lunch ordering form last evening and became, lets just say passionate, about the lack of support toward health this program has for our children. The school has a kitchen, a very large kitchen with a walk in cooler and separate walk in freezer. There is plenty of working space with stainless steel sinks, appliances and counter tops. According to the Moms who run the program, they order in McDonalds and other fast food because volunteers are non existent. Even the 'taco salad' which I believe is made in house, is served with Doritos as the 'taco'. The kids crush up the Doritos and toss the salad portion in the bag. Salad is now no longer a healthy option. I do treat my kids on these hot lunch days by making things like homemade chimichangas and have them pick out their favourite veggies, fruit, cheeses etc, they at least feel some satisfaction in this day. Some kids brag to them about the hot lunch they receive and some look at my children's lunches and try to convince them they should trade :) My son has come to a point where he wishes to write an article about toxic food and hand it over to his teacher. He is in grade 3. I know the teachers are not at all to blame here. This program is run by volunteers and it is in the hands of the parents to order the junk or pass it by. Kids cry and parents give in, this fuels a poor Hot Lunch Program. As for #2, a windchill of -20 is the reason to not send kids out for recess. I don't know about this but as a child, I recall braving this type of weather and kids just survived! I'll add, we send our kids out to play in this weather at home. They seem fine to me! Gym class sometimes consists of jumping jacks and stretching in the hallway. To compensate for this lack of exercise, we have our children in sports; hockey and ringette. Additionally, we are just active people and the kids have a dog they must walk. Our school community is small. I'm truly unsure how to start a change without the resistance which I received from the hot lunch ladies. If you know of schools that have gone through this, I'd love to hear how change was implemented. I need to advocate for these kids. 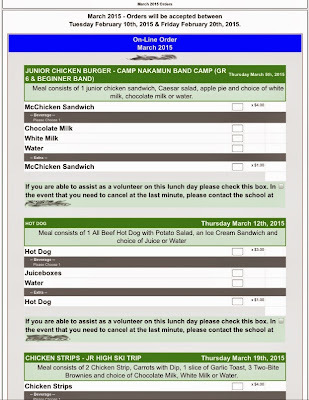 I have attached screen shots of March Hot Lunch options, none of which I will be buying for my kids just as I haven't since November 2014. I'm very interested in any input.